When you work from home, especially if you work as an independent contractor, it’s easy to put things off, especially if it’s an unpleasant task and/or you know that you have plenty of time to get it done. I know when I was in school, I would sometimes procrastinate on projects I didn’t enjoy – but then, I didn’t enjoy sharing my knowledge with others as much as I do now. However procrastinating on something you know you have to get done doesn’t make the project go away – if you procrastinate too long, you’ll actually end up creating more stress for yourself as your deadline gets closer. 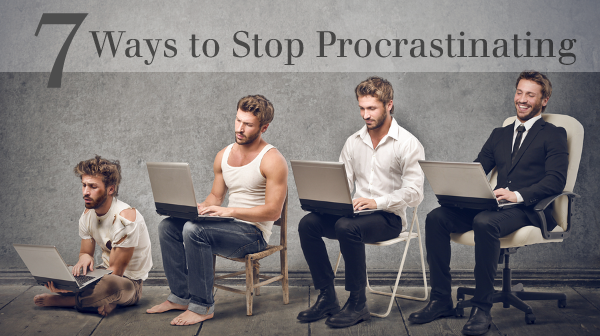 This post will discuss a few ways to stop procrastinating. If you can, get out of the house and go work somewhere else. If you work a phone job and/or have children this may not be possible, but if you’re doing freelance writing and using a laptop, try getting out of the house and working somewhere less distracting, like the library. When I have my tasks written down, I’m less likely to procrastinate on getting them done. If you have a lot of things on your to-do list, you might want to start with the things you know you’ll be able to get done quickly, and then move on to the larger, more time-consuming projects. This doesn’t mean get rid of it completely, but if you don’t need to be on the Internet to do whatever you’re doing, then resist the urge to get on it. If you have a Mac, there is a software program called Freedom that will disable your Internet connection for any amount of time that you specify. If you have a Windows PC however, you can disable your Internet a few different ways – you can unplug your router if you use one, or disable access through your firewall. This is one I actually disagree with, but I’m including it because it may be true for some people – personally, I find if I’m stuck on a certain project, if I switch to another project for a little while and then come back to the other project later, I’m more productive. One reason why people procrastinate is because big projects can seem too overwhelming. However, if you break a project down into smaller steps, it can seem less overwhelming. For example, if you have an article or blog post to write, your steps might be doing any research and/or pre-writing first, then write your rough draft, revise it, and then write your final draft. Think about your friends…which ones inspire you or motivate you? Spend time with them, and maybe ask one of them to be your accountability buddy that you can check in with to make sure you’re accomplishing the goals you set for yourself. Or you can check in on Facebook groups such as the WAH Goal Sharing group – I post my goals here often and I find that I’m much less like not to procrastinate when I do. Another great way to keep yourself motivated is to connect with people who have already achieved the goal you’re trying to achieve, because it’s living proof that the goal is achievable. Find out how they achieved the goal and try some of the things they did. These are just a few ideas for ways to stop procrastinating. If you have techniques that you use to stop procrastinating I’d love to hear them. I agree with you on the waffling between projects. I find the change to be helpful most times. I also am finding it helpful to mix up the types of projects. So maybe if i am writing a blog post, I might free flow write until i can’t think of anything else. Then i may switch and work on any video or image edits needed for the post, and so on. For that you must know what must be done and what is usually to be refrained from doing. Being well-advised can give you a sure track to achieving your goals.